A stunning Private Dining Room with glass balcony overlooking the Main Dining Hall, The Sugar Suite can be booked for parties of up to 10 guests. 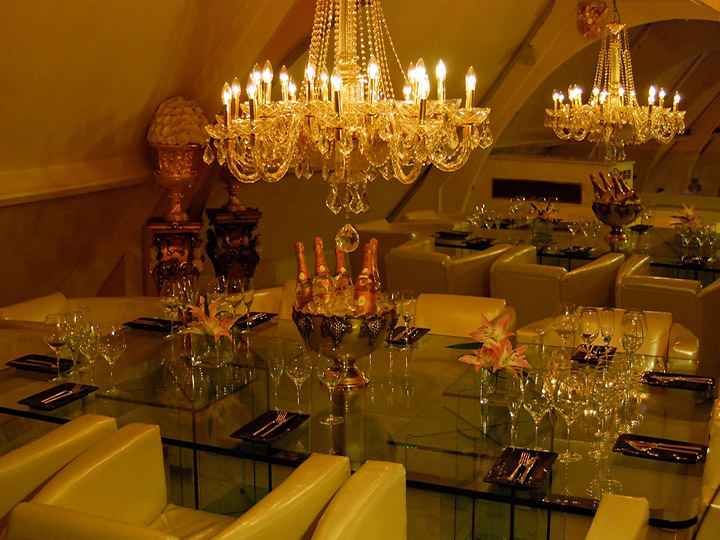 Our Sugar Suite is an exclusive private dining room which comfortably seats 10 diners. This dining area overlooks the Main Hall and open kitchens. For full V.I.P treatment you will also be allocated your own experienced and courteous waiter who will look after you for the entire evening, even when you are in the Zebra Bar. There is a £500 fee for the evening that must be paid on booking, which includes hire for the room and the waiter, so no other service charge will be put on your bill, however there is a minimum spend of £1000 for all your food and drinks for the entire evening. If you wish to cancel your reservation for The Sugar Suite, we require a minimum of 14 days notice. Please note we are unable to refund you money if cancelation is less than 14 days.